On November 14th Theresa May stood outside No 10 Downing Street and defended the Deal she had just concluded with Brussels. The Deal spells out how the UK will withdraw from the EU, yet stay in a customs union at least for a while, and avoid a physical border between Northern Ireland and the Irish Republic. But she still had to sell it to a majority in Parliament. For the first time since she cast her vote back in June 2016 – opting for Britain to remain in the EU – Theresa May let the veil drop and allowed herself to admit that it may not be possible for her, or anyone else, to implement Brexit at all. Even ardent Brexiteers, such as former foreign secretary Boris Johnson, have been saying since September that the deal being negotiated with Brussels is “substantially worse” than the “status quo” ie than as full a member of the Union. They may soon have to admit to themselves that it will be impossible to get a better deal for Britain than the one it already has, as a rather privileged EU insider. It is abundantly clear, from reportage up and down the country, that the British public has lost confidence in the way the Brexit process is being handled. They see Theresa May losing support daily in her own cabinet, they see the two main political parties divided, without coherent leadership at the top, and without a united Brexit strategy. It does not seem the right time for either major party to be leading Britain into unknown territory rather than sticking with the devil we know, which is the EU. A decision to reverse Article 50 and stay a member is increasingly cited as an option, even though the political road there is fraught with difficulty. I must declare now that this would be my preferred outcome. There is no better place for the UK to renegotiate its position in Europe than from inside the EU. There it has the tools, the platform and the voting rights to make a difference to its relationship with 27 of its nearest neighbours. The EU is changing, far faster than any stultified transition arrangement that might be negotiated for Britain for the time after March 29th 2019 when it should officially be leaving the union. Greece and Italy are at a crossroads. Germany is looking for a new leader. France’s president Macron is under fire from left and right. The democratic credentials of Poland and Hungary are in question. Britons are not the only EU citizens worried about uncontrolled immigration. This is no time to be leaving the EU to stew in its own juice. The centenary celebrations for the end of the First World War should have been enough to remind us that a divided Europe can lead to mindless devastation and economic ruin. However absurd some of the trappings of the EU may be – for me the maddest is the monthly migration of the European Parliament from Brussels to Strasbourg – they are the token of a collective attempt to transcend selfish nationalism and protectionism. I believe that direction of travel is the best way forward for Europe and perhaps the entire planet. The euro project may fail. Even its supporters have had to acknowledge that it is a flawed economic and monetary construct. 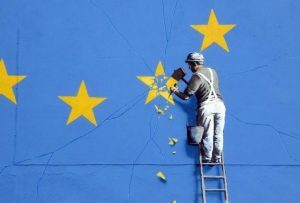 In the fullness of time either politics will adapt to allow mutual financial liability – furthering the “ever closer union” which is part of the EU mandate – or the euro zone will be dismantled or implode. Reverse-engineering the euro should not necessarily spell the end of the EU, which is a far nobler thing than a common currency. So will UK politicians be wise enough to save their country from the first two of Theresa May’s three choices? Unfortunately it seems most members of Parliament are more concerned with their own political careers, and the survival of their own party, than with the good of the country. Theresa May has said she believes her Deal is the best outcome for her country, and maybe in this case she is a rare example of a politician telling the truth. But that means she has changed her mind since casting her Remain vote in June 2016. Funny that: she has allowed herself to change her mind since the Referendum, but she and others continue to claim that the rest of the electorate spoke its mind once and for all on June 23rd 2016. Some opinion polls are indicating that a Second Referendum would have the UK firmly Remaining in the EU, by a majority of at least 54%. There are fears that a Second Referendum would polarise the country even more and that it would somehow betray the trust of those who voted in the first. Personally, I believe that giving voters an opportunity to express their opinion again, with clearer information on what is at stake, would be less divisive than denying them that chance. There is a risk, however, that a Parliamentary majority will not vote for a Second Referendum. There is residual pressure from other quarters for politicians to “Just get on with it” having been given their instructions in 2016. There is a risk that a second referendum campaign would be bloody and as full of manipulation and misinformation as the first. There is also a risk that voters themselves would be so fed up with the Brexit debate that they either do not vote at all, or angrily vote Leave as another protest against London and the political elite. If that were the outcome, even the firmest of Remainers would have to accept it second time around.